This project was initiated with the development of the City's web site. The purpose of which was to make City Information readily available to the public. The project was taken to the next level by putting the web site on information kiosks. 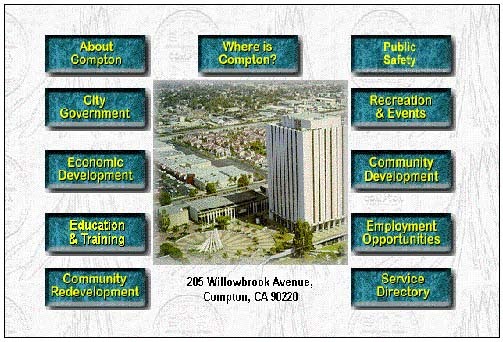 TouchVision developed Compton's web site, and then made the web site available to the public at 3 kiosks. On-line access is provided to a variety of city services including transit routes, council agendas, building permits, business licenses and business services, community development grant program and other city information. Locations include a Metro Blue Line rail station, City Hall, and Compton College.